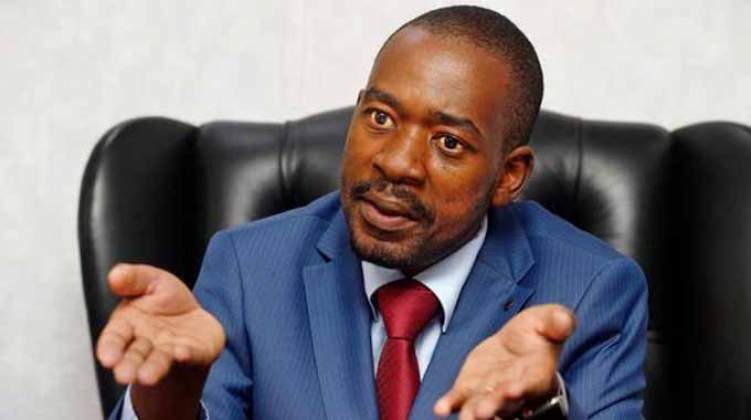 Chamisa who came to the helm of the country's biggest opposition party following the death of founding MDC president Morgan Tsvangirai last year is likely to be challenged by Mwonzora and party vice president Elias Mudzuri at the congress. Mwonzora and Mudzuri have both expressed their willingness to take the charismatic 41-year-old lawyer head-on at the forthcoming elective congress if nominated. Addressing MDC structures in Masvingo ahead of the much-awaited congress scheduled for May 24 to 26 at a yet-to-be announced venue, Chamisa launched a scathing attack on James Gumbi — the provincial chairperson who is aligned to the Mwonzora camp — for letting the party down. "In Masvingo, we lost dismally (in last year's elections). The chairperson did not do much to campaign for the party hence the poor showing," Chamisa said. Gumbi, who has been a thorn in the MDC leader's backside, might have worsened his situation when he recently told the Daily News that he did not see anything wrong with Zanu-PF deputy youth league chairperson Lewis Matutu predicting a Mwonzora victory against Chamisa. Chamisa, who also hails from Gutu in Masvingo, hinted at the weekend of possible change of guard in the region. "We want to rejuvenate the party and reclaim our seats we once won in 2008. In last elections, we only won one seat in the whole province," Chamisa, who was in the company of Mwonzora, Mudzuri and national organising secretary Amos Chibaya, among other senior party leaders, said. This comes amid reports that Chamisa is keen on former deputy youth minister Tongai Matutu taking over the reins from Gumbi when the provincial congress is held. With Matutu eyeing the post of provincial chairperson, what the president did was to show the party structures the direction he wants the elections to go because he does not trust Gumbi after his alleged role in the controversy surrounding the Masvingo mayor," a regional source told the Daily News on condition of anonymity. Chamisa views Masvingo mayor Collen Maboke as a product of some clandestine arrangement he had with Zanu-PF, which led the MDC official to defy a party directive to have its preferred candidate, Godfrey Kurauone, for the position of mayor. It is alleged that Maboke struck a secret trade off deal with Zanu-PF councillors for the position of deputy mayor in exchange for their votes for the mayoral position. Chamisa contends that with three councillors out of 10, Zanu-PF stood no chance of taking the deputy mayoral position had it not been for the bargain and the backing he allegedly got from Gumbi as provincial chairperson. As a result, the MDC has been exerting pressure on the mayor to step down. At the meeting, Chamisa gave Maboke a week to resign or face expulsion from the MDC and lose his council seat. Contacted for comment, Gumbi said he did not know why the MDC leader attacked him. "I'm not sure how that came about but you can call me later in the day," he said. He was, however, not taking calls when further attempts to contact him were made. At the weekend meeting, the MDC leader said the party had since dropped the name MDC Alliance to revert back to just the MDC. "We are resorting to our original name, the MDC. We are no longer MDC Alliance. The alliance addition was for the elections to distinguish ourselves," he said referring to the integration of former secretary-general Tendai Biti's People's Democratic Party (PDP) and Welshman Ncube's MDC last year. "Like the late leader Morgan Tsvangirai said, we should unite and come back. The likes of Biti and (Welshman) Ncube are back and there is no longer PDP, we are now one huge family." He also warned party officials against unbridled ambition saying "people must learn that being big-headed does not pay. Look now (Thokozani) Khupe is nothing more than a crocodile pawn," Chamisa said, implying the MDC-T leader could be working with President Emmerson Mnangagwa whose nickname is "crocodile."